This Bible belonged to, and was presumably made for, Robert de Bello (i.e. 'of Battle', near Hastings), who was abbot of the Benedictine abbey of St. Augustine, Canterbury, from 1224-53. He was clearly concerned to have an accurate text--it has been corrected carefully throughout--and his influence may be responsible for some of the very unusual imagery included among the initials. 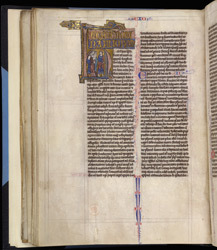 To the right of the initial 'H' to Exodus, Moses (identified by his horns) parts the Red Sea (depicted a vertical blue and red wavy lines), so that the Israelites may follow him across the dry sea-bed to safety. In the upper margin is a pencil instruction indicating the opening words which had been deliberately omitted by the scribe, to be executed in gold by the artist.